Our Paella Weekend sold out within a week so we have organised an extra day of firing up the pans and serving traditional meat & seafood Paella along with delicious Spanish tapas on Sunday 3rd July. Enjoy live tunes and keep cosy in the Barn. Be quick as these tickets won't last!! Adult tickets $30 per adult which includes branded Golding Spieglau glass, first wine pour from our Market Series, and a serve of paella. Kids $15 which includes cheeseburger and fries, cookie, fruit juice and activity pack. Vegetarian and non-seafood options available. 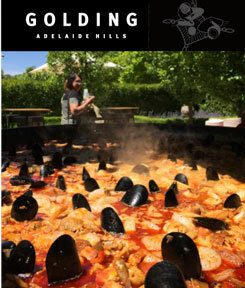 Please contact Golding Wines on 8389 5120 if you require further information.